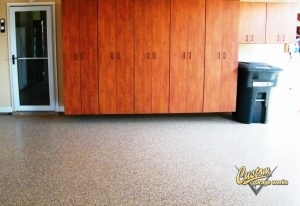 If You Have Questions About Garage Flooring Or Storage Options, Give Us A Call! We’re Here to Help! Welcome to our FAQs page! Below, you will find many of the commonly asked questions we get about some of our services here at Custom Garage Works. However, if you have any additional questions, please don’t hesitate to call us at 214-494-9068 or 817-308-1305 and speak with one of our friendly associates. Keep in mind that all of our projects will have at least one of our two owners involved in the installation process, and all of our crew members are full-time Custom Garage Works employees, fully trained to complete your garage renovation to perfection! We are here to answer any questions you may have, so you can confidently choose the best options for your garage. From storage solutions to floor resurfacing, we have the answers you need! We begin by diamond grinding the concrete, which allows the pores to open up. After repairing any surface blemishes or cracks in the concrete, we put down the pigmented base coat. To do so, we pour it out and spread it with a squeegee and back rolling. The base coat will then penetrate deep into the pores of the floor. A complete broadcast of 100% recycled vinyl flake is applied in the color you choose. The floor will then cure for 2 – 3 hours so the flake can bond with the base coat. Last, we lightly scrape the coating to remove any loose flake, and the remainder is swept up. The top coat follows the same application method as the base coat. By using the same product for the base and top coats, we create a cross-linked result that locks in the flake and leaves your coating 10 times more durable than epoxy. When can I use my floor again after the floor is installed? The floor can be walked on in as little as 4 hours, and you can return items to your garage around 6 hours.The cure time varies depending on the temperature outside, but in ideal conditions, you can drive on your floor within 24 hours. What if my floor has a crack? Hairline cracks are filled in with a base coat and will not need extra attention unless the crack is particularly deep or wide. A unique concrete patching compound is used to repair any pits or cracks. We then allow the patching compound to completely cure before we continue with the garage floor prep and detail. What’s the difference between Polyurea, Polyaspartic, and Epoxy? Polyaspartic coatings are a type of polyurea coating with a longer cure time. Most of the polyurea floor coatings you read about are also polyaspartic. This kind of coating is considerably stronger than epoxy, because it cures faster, is resistant to yellowing and hot tire pickup, and can withstand impact from dropped items such as tools. It also comes with a lifetime warranty, which you won’t find with epoxy. Will you use acid etching or acid treatments on my floor? We never use acid etching to prepare floors. We only use diamond grinding, in order to create the best possible surface for your floor coating. How do I clean my new floor coatings? Due to the glossy texture, most spills will wipe right off. However, you can mop with warm water and dish soap when needed. Will every concrete area in my garage be coated? 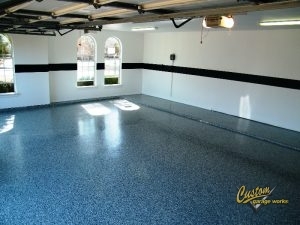 We can coat as many of the concrete surfaces in your garage as you want! Will your cabinets be custom fit to my garage? Yes, depending on the line of cabinets you chose. 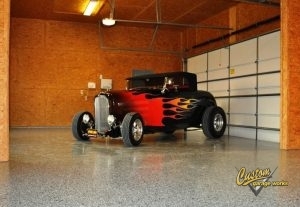 We have the top of the line cabinets which can be custom fit for your custom garage. Are the cabinets free standing or wall mounted? All cabinets are wall mounted, even the ones that are 6″ off the floor with feet. Our rugged Bulldog Garage Cabinets feature ¾” box construction, caulked interior seams and CNC machining for accuracy. All sides are sealed with a laminate or melamine to help resist the moisture and as a barrier against the extreme temperatures & humidity. All door & drawer edges are sealed and bound with 3mm banding for extra durability which helps to prevent moisture from getting inside, making it a durable, long-lasting cabinet. We have the perfect cabinet solutions for you. How high does my ceiling need to be to allow for a car lift to store my cars? Depends on the height of the car you are lifting. In most cases, a 10′ ceiling is adequate for most cars. Will city permits need to be pulled to customize my garage? In most cases no. The only time we would need to pull a permit is for detailed electrical additions. We can address those if any during the quote process the first time we visit your garage. Car Lifts also are exempt from permits as most of our lifts are 110/115v and plug right into a current outlet in your garage. Can I setup/install the lift myself? Most definitely! Two guys can put up one of our Rotary 4-post lifts in 5-6 hours…depending on their wrench turning skills. Some of the parts like the runways and the columns can weigh over 100lbs…so if your back is shot or you just don’t want the hassle of putting it up, let us take care of it for you. We have installed many a lift. Our lifts do not have to be anchored to the floor due to the large foot print on each column. If you chose a caster kit for your lift, it can be moved around your garage or wheeled out in the drive to work on those nice spring and fall afternoons. What colors can I get my lift in? 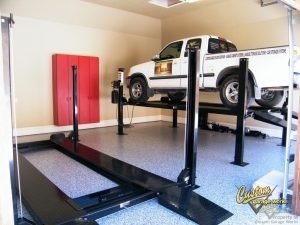 The CCG-8 4-post and the motorcycle lift come in black only. 2-Post Lifts come in Black and Blue color. Can I get my 4-post in 220V? Yes on the Rotary Lifts this option is available. If I want the lift mounted is that possible? Yes as long as you have a concrete thickness of at least 4″ Motorcycle lifts, of course, are not mounted as they roll up as the lift is engaged. Can I order rolling jacks or jack stands on my 4-post lift? Manual Rolling Jacks are available for the CGW-8 lifts only. Sliding bottle jack stands are available with either lift. Sliding bottle jack stands are available with either lift. Updated on January 26, 2018 at 8:45 pm by Custom Garage Works.